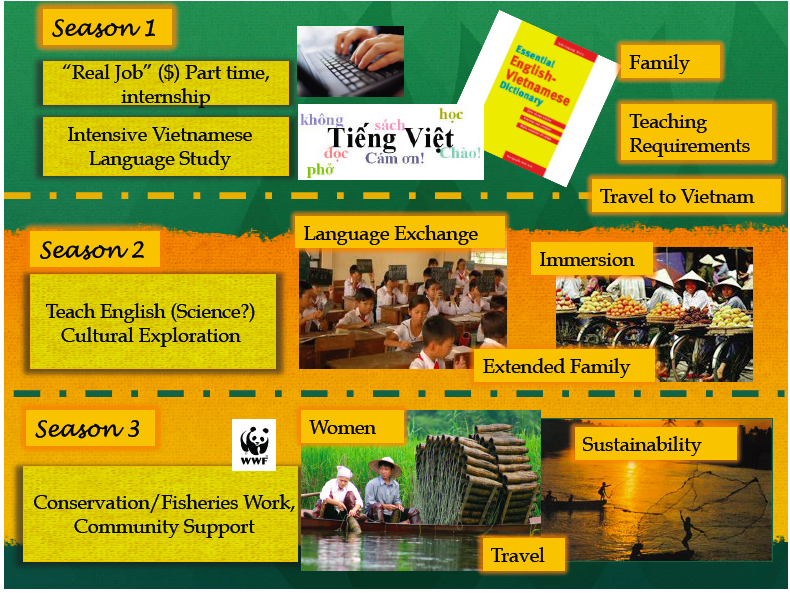 My cousin Quan and I caught a bus down to the Mekong Delta yesterday. 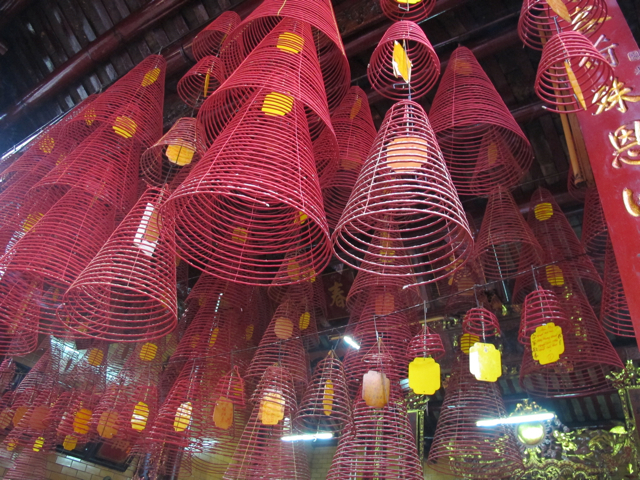 The city of Can Tho sits along one of the major tributaries of the Mekong that fan out across southern Vietnam. 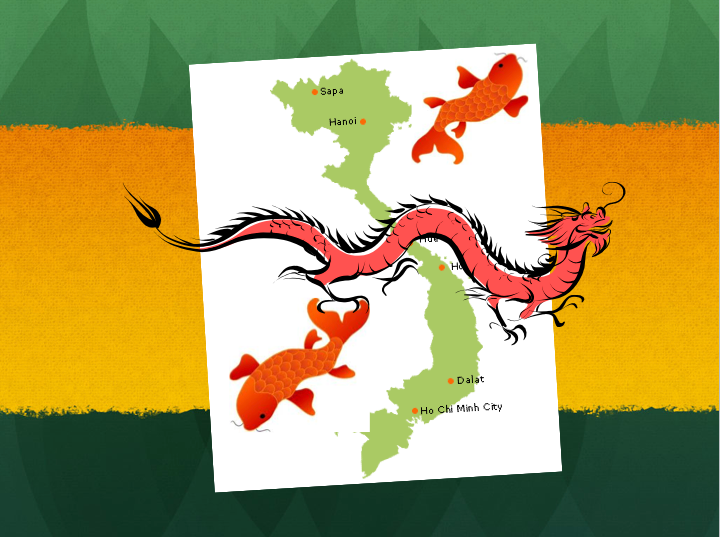 It’s my chance to get some quality fish time in the Vietnamese section of this mighty river. 1 kg for about $3. I’ve had mangosteens only once in the US, and they set me back more than $1 per fruit. So until they become the next kiwi – load me up. The bus ticket to travel 100 miles cost all of $5.50 – not too shabby. 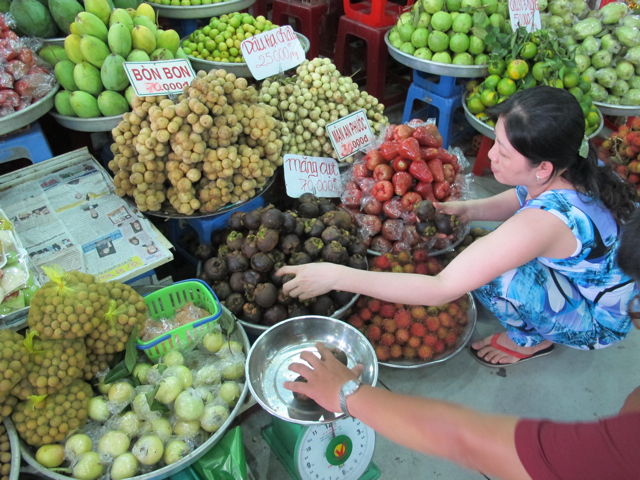 An early lunch pit stop let me stock up on my all-time favorite Southeast Asian fruit – mangosteens. It would not be too much of an exaggeration to say that this tartly sweet delight was a large contributing factor to my taking this transpacific trip – well, it’s a major highlight at least. Incense cones burning in a Chinese temple by the riverbank. 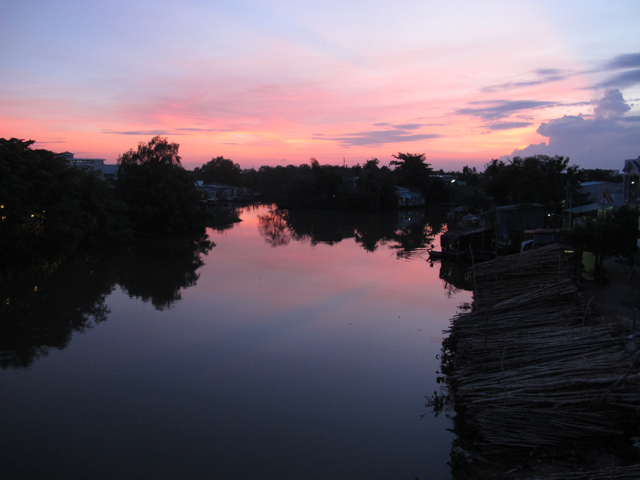 Once we arrived in Can Tho, we rented a motorbike for the evening, driving first to the river’s edge to walk around. Then travelled to the edge of town as the sun was setting. 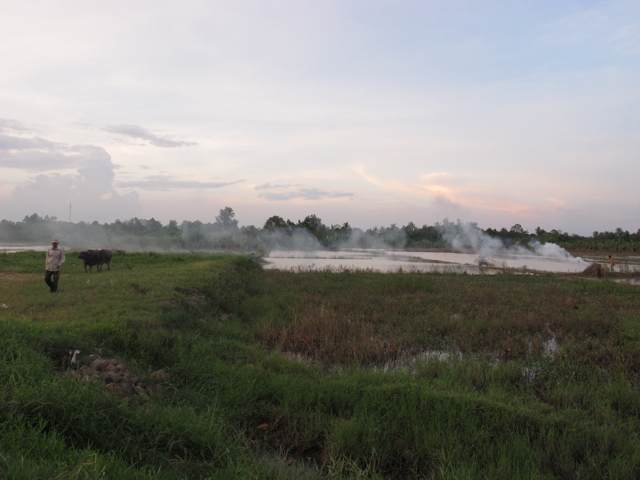 We pulled over to watch a man burning some reeds along the water as another man walked his water buffalo nearby. 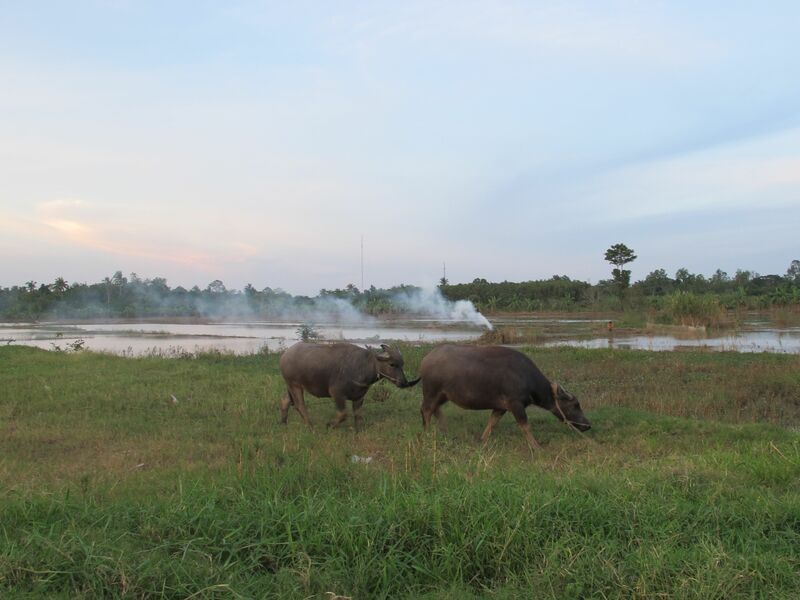 I have a special fondness for water buffalo – they’re at the heart of pastoral Vietnam, strength in the mud and the bright green rice fields. Standing there was one of those moments when it dawned on me that I am most definitely in another country. A pearl of a nearly full moon hung in the sky, and old man practiced his Tai Chi exercises beside us. It was so lovely and tranquil. I’ve experienced two classic Vietnamese “firsts” since arriving in Ho Chi Minh City: travelling via motorbike and eating durian fruit. If you know anything about durian, I bet you can guess which one was more enjoyable. 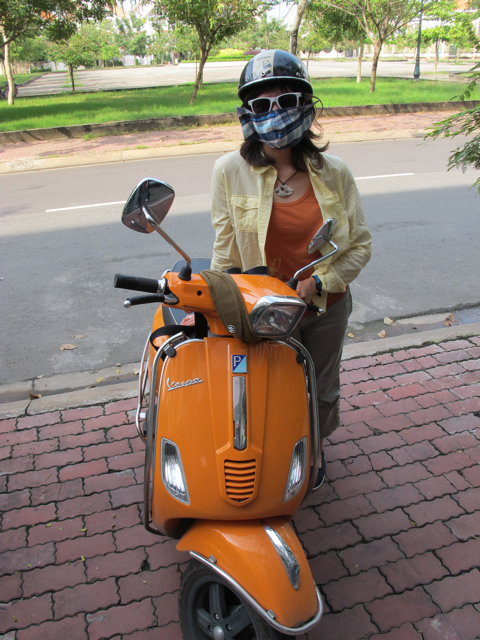 During my one other trip to Vietnam five years ago, riding on motor scooters was not part of the agenda with my mom and aunt. But for my cousin, it’s the basic way to get around, and I’ve readily slipped into the role of passenger. I don’t think I’d ever be crazy enough to try driving here myself. But with an experienced driver doing the steering, it’s a pretty exhilarating ride. A mental wall is all that separates you from the other bikes, cars and small trucks whizzing by your elbow. The traffic is both chaotic and fluid – people cutting across oncoming traffic at will, dodging and weaving, navigating a precarious balance of yielding and seizing the right of way. It’s pretty miraculous that people don’t collide at every turn. At four-way intersections, ample warning honks substitute for stop signs. My younger cousin doesn’t try to navigate the madness herself. She commutes to her job as a passenger via a motorbike taxi, or “xe om.” “Xe” means “motorbike” and “om” means “hug” – in other words, hang on to your driver! But unless the driver is your significant other, actually latching on to them is somewhat unseemly. I’m usually clutching the back railing of my cousin’s bike, but most passengers apparently have better things to do than hang on – like spooning up a cup of iced sweets, adjusting hair, or smoking a cigarette. Kids hold their bookbags, slouching nonchalantly on the back of their parents’ bikes as if they were strapped in. I’ve observed that a motorbike is a fine way to transport your dog, a coat rack, or a family of four. Fortunately, the only motorbike casualties I’ve seen so far are the flip flops – single shoes, usually kid-sized, lying forlornly in the middle of the road. And then, of course, there is the fashion. Back in the US, I used to laugh at the people I saw wearing facemasks to fend off sun or pollution. Covering up your face with fabric and sunglasses erases just enough human features to look extraterrestrial. But in Vietnam, when your face is practically on the level of a thousand exhaust pipes – vanity be damned. Give me the mask. I’ve seen every variation from the basic surgical-style facemask to a full-on Lawrence-of-Arabia-style cowl that wraps around the whole head, face and neck. You can even get a jacket, hood, and mask in matching print. The one I grabbed one off a street rack is like a large flap of flannel. And to be honest, I rather enjoyed the feeling of disappearing behind it, travelling incognito like the locals. Hopefully it’s keeping some of the nasty particulates at bay. Halloween costume, anyone? Thank goodness a helmet is now another normal part of the ensemble. Five years ago, helmets were a rarity, but now wearing one is the law, and it seems like 90% of people comply. With the traffic as nutty as it is, I’d say the drivers and riders need any safety measures they can get. 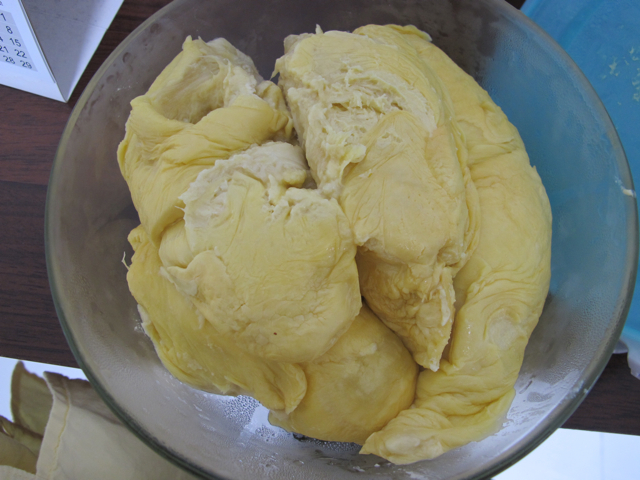 And now a (brief) note on durian…This infamous fruit, yellowish green and spiky on the outside, about the size of a large spool of cotton candy, is probably regarded as the most foul-smelling fruit there is. I don’t think I inhaled long enough to describe it in detail, but it’s extremely pungent, like something rotting…and my great-aunt loves it. So, like a cultural right of passage, I gamely gave it a try. The consistency is creamy like custard and has a somewhat nutty taste. Not completely unpleasant on its own – but not exactly what I seek out in a fruit. And coupled with the smell, well…at least I can check this notorious classic off my list. Hopefully there is more motorbike riding in my future, but I’ll pass on the stinky fruit.